A live coding environment for Overtone and Leipzig. 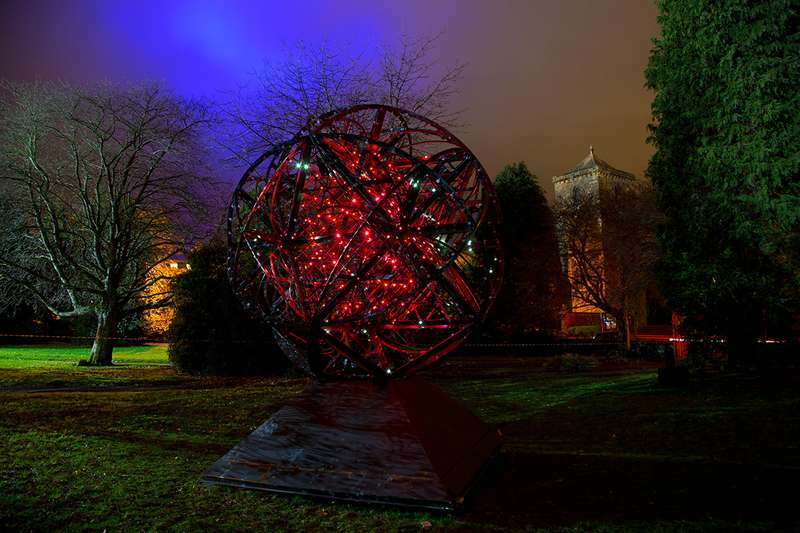 Cosmoscope is an art installation from the 2018 Lumiere Festival of Light, created by a team of artists and scientists culminating in a monumental sound and light sculpture. Inspired by historical astronomical instruments and models of the cosmos, it looks at the infinitesimal to the infinite. Animation of the light sculpture was driven by Dr Nick Rothwell using ClojureScript. Images are just data (numbers) that your application does something visual with. Modern graphical images are described as 2D or 3D co-ordinates (points in space). Paths are drawn along these points to make an infinite number of shapes, just like a join the dots puzzle. Animation is simply multiple images drawn or displayed one after the other. Quil - generate 2D graphics and animations. One of the ClojureBridge projects is Turtle, helping you understand the basics of using functions. Thi.ng - an open source collection of 20+ computational design tools for Clojure & Clojurescript.